Hybrid cloud is your IT platform of the present. 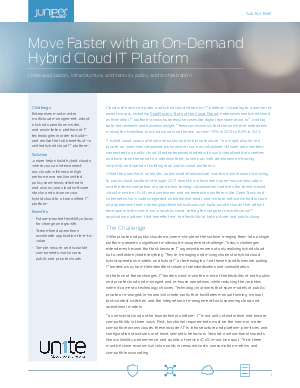 Juniper Unite Cloud helps you win the race to the hybrid cloud because it offers the flexibility of hybrid cloud and hybrid operations models while effectively confronting and addressing the overabundance of variables in hybrid IT technologies. Juniper’s product portfolio offers the ultimate flexibility, so that you can seamlessly integrate cloud stacks and unify policy in and across today’s and tomorrow’s private and public clouds. Contact your Juniper Networks representative to learn more about this hybrid cloud solution.